Have you been considering LASIK vision correction surgery in Lebanon, PA? You will find the best surgeons in the region at Eye Consultants of Pennsylvania who offer patients the most technologically advanced technique – Bladeless Custom LASIK. The Eye Consultants of Pennsylvania staff includes a nationally-recognized team of specialized ophthalmologists, ophthalmic surgeons, and eye care professionals who have been trained by some of the most respected medical facilities in the world and have vast clinical experience in a wide variety of eye disease and surgical services. The team has provided Berks, Lancaster, Lebanon, Montgomery, and Schuylkill counties with high-quality eye care for nearly 50 years. We have five locations in Lebanon, Wyomissing, Pottsville, Pottstown and Blandon. LASIK stands for “laser in-situ keratomileusis.” It is a very short procedure that is used to treat nearsightedness, farsightedness and astigmatism. A thin flap is cut in the cornea using either a handheld blade or a laser. Then a laser is used to slightly reshape the cornea to improve the way the eye focuses light rays onto the retina. LASIK may be able to reduce or eliminate your dependence on glasses or contacts. Why Choose Eye Consultants of Pennsylvania? As with any other type of surgery, a good LASIK surgery outcome will depend primarily on the doctor’s experience, the quality, technology and safety standards of the surgical center, and how carefully the doctor evaluates your eyes before surgery. Adam J. Altman, MD, Jonathan D. Primack, MD and Kevin J. Shah, MD are among the very best LASIK surgeons in Pennsylvania. They are board certified, cornea fellowship-trained specialists who have a combined 45+ years of experience and have successfully treated thousands of patients. Dr. Altman was fellowship trained at the world-famous Wills Eye Hospital in Philadelphia. Dr. Primack was fellowship trained at the Massachusetts Eye and Ear Infirmary at Harvard Medical School. Dr. Shah was fellowship trained at the Cincinnati Eye Institute at the University of Cincinnati. 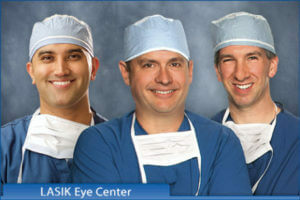 These three eminently qualified LASIK surgeons prefer the state-of-the-art Bladeless Custom LASIK technique, also called “all-laser” LASIK, which is the most technologically advanced and safest way of performing LASIK, as well as the PRK (Photorefractive Keratectomy) technique, which is recommended for individuals who are not optimal candidates for LASIK surgery. Are You a Candidate for Bladeless LASIK Surgery? If you are nearsighted, farsighted, or have astigmatism, at least 18 years old, have not had previous eye surgery, and have never been diagnosed with an eye disease (such as cataracts or glaucoma), you may be a good candidate for LASIK surgery. The only way to know for sure is to schedule an evaluation with our cornea specialists. Dr. Altman, Dr. Primack and Dr. Shah are very conservative in selecting patients for LASIK or PRK and must first thoroughly evaluate your eyes by testing for corneal thickness, pupil size, refractive error, etc., and discuss your goals and expectations. If you live or work in the Lebanon, PA area and are tired of wearing glasses or contact lenses, consider LASIK vision correction surgery at Eye Consultants of Pennsylvania. Get in touch with us today to schedule a free LASIK evaluation.